Zela Margossian Quintet is comprised of talented and multi-cultural musicians from Sydney who seamlessly combine their authentic sounds to create an exotic musical atmosphere that is sure to take you on an emotive and pleasurable journey. Lead by Zela Margossian, the Quintet was formed in 2016 and participated in the Sydney Summer Jazz Festival in January 2017 and featured in The International Women’s Jazz Festival in November 2017. 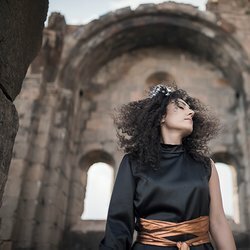 The Quintet performs original works composed by Zela Margossian, in addition to Armenian folk pieces, arranged by Zela with an input from the members of the band. Originally composed by Alan Hovhaness, and re-worked / re-arranged + added to by Zela Margossian.